The Lila range is a fabulous selection of vintage inspired white, wooden furniture designed with bedroom and living room use in mind. 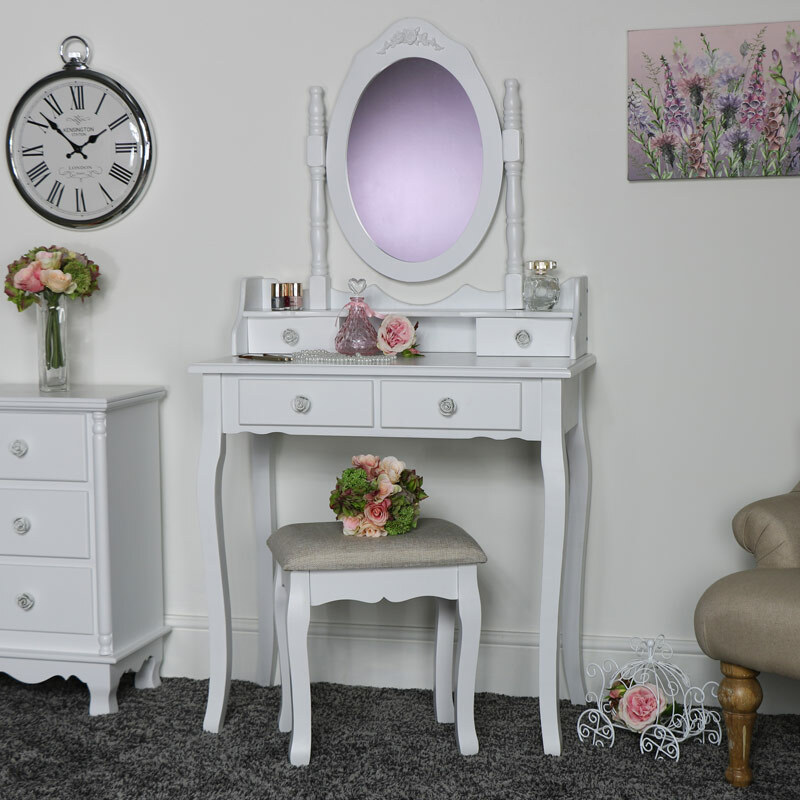 This set is made up of a full dressing table set with a pair of bedside chests and a large chest of drawers, perfect for a shabby chic or vintage inspired bedroom. 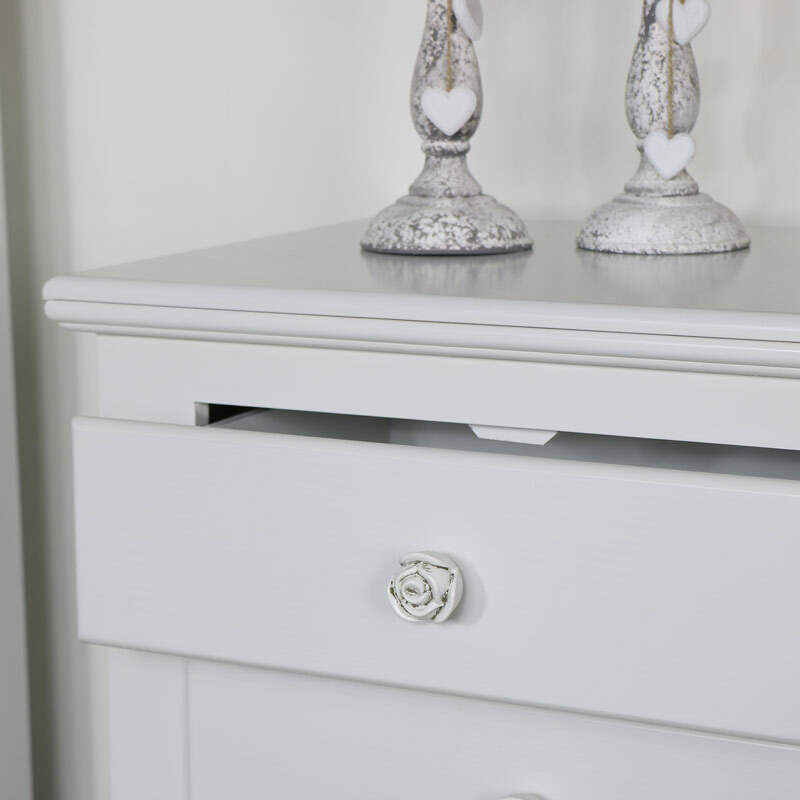 The Lila range has a satin finish and carved rose style handles on each piece. The Lila ranges vintage, shabby chic style and slim, simple design make this the perfect furniture collection for anyone wanting to add a touch of understated elegance to their home. This furniture set comprises of the stunning Lila Range dressing table set, including stool, swing mirror and two drawer console table as well as a fabulous six drawer chest. The Lila range is a fabulous selection of vintage inspired white, wooden furniture designed with bedroom and living room use in mind. This set is made up of a full dressing table set with a pair of bedside chests and a large chest of drawers, perfect for a shabby chic or vintage inspired bedroom. 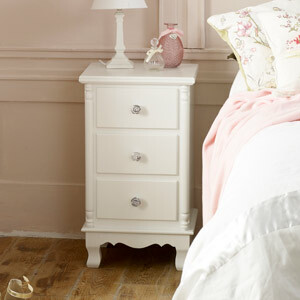 The Lila range has a satin finish and carved rose style handles on each piece. The Lila ranges vintage, shabby chic style and slim, simple design make this the perfect furniture collection for anyone wanting to add a touch of understated elegance to their home. This furniture set comprises of the stunning Lila Range dressing table set, including stool, swing mirror and two drawer console table as well as a fabulous six drawer chest. Constructed from wood with a white painted satin finish. The chest of drawers come fully assembled while the dressing table set is flat packed with fixings and instructions included. We have a stunning range of furniture in a array of styles, colours and finishes to suit any decor theme.